Gabriela and The Widow ($14.95, 280 pp, 6×9 Trade Paperback ISBN: 978-1-60381-147-7), a work of literary fiction by Seattle author Jack Remick, tells the story of a dying aristocrat and the Mixteca caregiver who helps her assemble the jumbled pieces of her past, a process that gives them both love, closure, and the courage to move on. 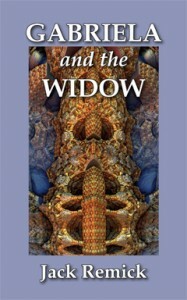 Gabriela and The Widow was a 2014 finalist for the Montaigne Medal (Eric Hoffer Award) and ForeWord Magazine’s 2014 Book of the Year Award (literary fiction). Orangeberry Book Tours gave Gabriela the “Best Women’s Fiction” Award (Hall of Fame, 2013). “The characters of Gabriela and la viuda have remained with me since I read the last line and closed the book. Jack Remick is a master storyteller, an intuitive man and a writer of the highest caliber. With Gabriela and The Widow, my first introduction to the author, he has gained a new fan. I highly recommend this book to you.” Read more …. “A book that is deep and more than just a story is a book that will stay in your head for many years. I think I found such a book …. The story is extremely captivating. You want to keep reading to find out what is next is store for the young girl and what new things she will discover with from the widow …. More than a simple story, this is a detailed examination of life.” Read more …. Jack Remick is a poet, short story writer, and novelist. In 2012 Coffeetown Press published the first two volumes of Jack’s California Quartet series, The Deification and Valley Boy. The final two volumes will be released in 2013: The Book of Changes and Trio of Lost Souls. Blood, A Novel was published by Camel Press, an imprint of Coffeetown Press, in 2011. Click here to find Jack online. She stood at the window watching the blackening sky. She smelled the dry hot dusty desert air. Heat boiling in through the window made her sweat so she unbuttoned her chambray shirt and rubbed her belly, fingers smooth over her slick skin. In the sky, she saw a flicker of light—a single yellow glowing dot. Leaning on the sill of the open window, Gabriela watched the sky fill with a swarm of fireflies like the ones she had seen some evenings in the jungle. The swarm grew until the sky framed by the window glowed like light in a mirror. The light was so bright and the insects so many that they lit up the cactus in front of the steel chain fence and under the cactus the stones on the ground. The swarm of fireflies kept getting bigger and with the swarm there came a dry hard clicking like the sound of teeth chattering. And then across the sky she saw darting bats. Black and gray bats swooping through the mirror of light, hundreds of them. Where they struck, holes gaped open in the light, leaving long trails of black. The flutter of wings beat against the rattling of the fireflies and chills ran up Gabriela’s arms as the bats turned and swooped, smashing into the glowing swarm of insects until only a few dots remained against the blackness and then there was only the sky, empty, and off in the distance and high up and beyond, stars sparkled. There was silence. Gabriela glanced down at the table where she had been working on the List—strips of paper overflowing from the box, sheets of paper with long lists of places and objects on them and there, on a strip of yellow paper a single firefly struggled. Its light blinked once, twice, then died. She picked up the strip of paper with the insect on it and walked to La Viuda’s room, where light spilled out into the dark hallway. “I will bring you crackers and cheese,” Gabriela said. “Zurich is in Suiza,” La Viuda said. Gabriela waited until La Viuda closed her eyes. Then she turned off the lamp and, taking the dead insect with her, returned to her room, to the desk, to the box of strips of paper. On the table beside her sat the boxful of paper slips. Small rectangles of paper each written in a different hand—some slanted to the left, others to the right. Still others were printed in block letters. They were written in a rainbow of green and black and red and blue inks, some of the notes so faint they read like fingerprints of ghosts. But all of them were jumbled in a chaotic mess in the box and as Gabriela tried to sort them out she grew impatient. The Atahualpa? And what was a bergamot pot? She had no idea. And so Gabriela began again. On sheets of white paper, she made units that contained a date, an object, a place. And under that a slot for photo and another for letter. She knew now that with those parts, she could bring some order into La Viuda’s life. She also knew that everything depended on the old woman’s memory.